BEAUTIFUL and NICE QUALITY Personalized Name bracelet and anklet is a special gift; choose it, choose compliments. Personalized name anklet braclet is so popular right now, it is fun and fashion, everyone will want to know where you got it because they also own this unique gift. All of our products are handmade, material is only of 925 sterling silver, wearing sterling silver prevent allergy, long time wearing keeps you a good health. Magnifies our thoughtful gesture and makes the recipient feel extra special. This super cute name necklace makes the perfect gift on your list. Many occasions are very well, for example: Valentine's Day, Mother's Day, Christmas, Easter Day, Thanksgiving Day, or some time that's memorable, Birthday, Wedding, Anniversary, Graduation. We need 2-3 working days to engrave your pendant necklace; and it will normally take about 12-15 calendar days for delivery; most of time, it just take 5-10 calendar days for delivery. -- MISSNITY is committed to provide the best jewelry and the best services to our customers, your feedback is our motivations to improve. Just contact us if you have any concern with the item. We will assist you in finding a solution promptly! Firstly, you should keep your Jewelry away from any chemicals, you know the chemicals will corrode your jewelry. Secondly, please do not put your jewelry into water especially seawater, water will fade jewelry's color. Three, please clean your jewelry with clean and dry duster, to keep your jewelry clean. At last, when you don't wear your jewelry, please clean it and put in a sealed box. 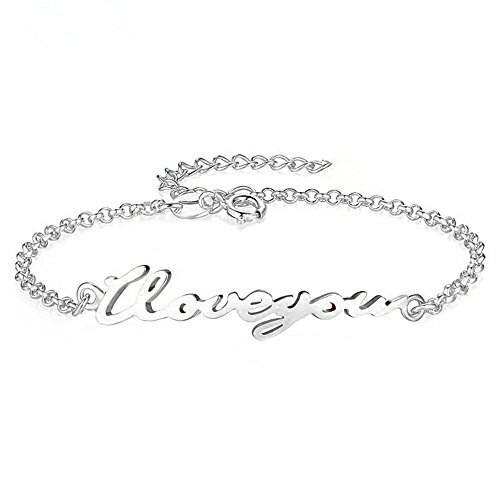 ANY NAMES - Personalize this 925 sterling silver name bracelet and anklet charm with any names. CAPITALIZED FIRST LETTER -- First letter will be capitalized, it can be up to 10 characters with no spaces. SIX CHAIN SIZE AVAILABLE -- Please specify chain length: 5.5"/6.5"/7.5"/8.5"/9.5"/10.5" (if you not specify it, the default chain length is 6.5 inch), and extended chain: 1.18". DEAL GIFT CHOICE -- Come in an elegant jewelry gift box. Perfect for any gift giving occasion, birthday, graduation, wedding, anniversary or Valentine's Day, Christmas Day, Thanksgiving Day to women, couples, mother, wife, girlfriend, daughter, sister, bridesmaid, best friends or just as a surprise to remind that special one you care. PERFECT AFTER-SALES SERVICE -- MISSNITY is committed to provide the best jewelry and the best services to our customers, your feedback is our motivations to improve. Just contact us if you have any concern with the item. We will assist you in finding a solution promptly! If you have any questions about this product by MissNity, contact us by completing and submitting the form below. If you are looking for a specif part number, please include it with your message.